Based on a mythical vector arcade machine of the late 1980s that was never released, Vector-Z is a space shooter with advanced vector graphics and particle systems designed to dazzle your senses… it's as if the 1980's arcades never went away and the games kept getting better. 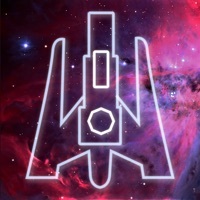 Vector-Z is a unique, retro-style arcade game with glowing multicolor vector-graphics, analog synthesized sounds, and a retro soundtrack with amazing spaced out tunes to zap extraterrestrial invaders to. Some of Vector-Z's aliens have shields you have to time your shots to break through. There’s also an asteroid bonus level where you can break up asteroids for points, and break up bigger asteroids for power-ups, including bonus shields, extra lives, score multiplier, and a faster fire rate. HINTS: • Vector-Z’s ship holds 2 missiles. One fires from each wing, so there’s a slight offset. There is also a brief reload time. • Aliens are worth more points when they are attacking you. Even more points when they are really close! • Go for the bonus points from accuracy: at 50% you get 100 pts per hit, 200 pts at 75%, 400 pts at 90%, and 800 bonus pts per hit with 100% accuracy! • Aim for the bigger asteroids to collect hexagonal power-ups Vector-Z is compatible with iCade, and requires iOS 7.1 or later. Nice and simple. Feels like the old shooter games but response moving ship back and forth is very laggy. 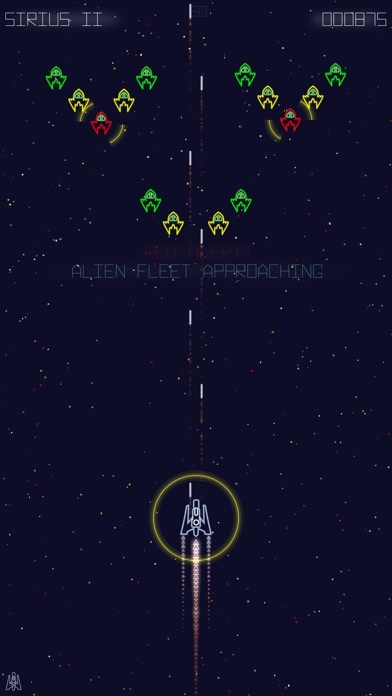 Game adds novel features to classic Galaga genre playstyle. Shields on both player and enemies, creative attack patterns, and asteroid rounds are all engaging. Accuracy bonus adds depth for those patient enough to time their shots. Looks clean, runs smoothly and responds predictably. Vector-Z is the perfect shoot 'em up that all retro gaming enthusiasts should pick up this holiday season. It will remind you that being a child in the 80's was truly rad and when you pair it with an iCade, you'll feel like you're right back in the arcade pumping quarters into glowing pieces of furniture determined to defend the galaxy from hostile invaders. The only thing you'll need to complete this experience is a pair of MC Hammer pants and a calculator watch. Totally primo... Sometimes retro gaming can be, well, too retro, with hi-res assets being reduced down into pixelated blobs that require a child's imagination to fill in the gaps. Thankfully, Vector-Z strikes the perfect balance between old school and new school with an aesthetic that provides that shot of nostalgia, but also validates your decision to own a device with a Retina HD display. Vector-Z looks simply gorgeous and is backed up by all the analog-synthesized sounds you'd expect from a retro shooter. Both the touch controls and iCade pairing offer silky smooth arcade action, once again showing mercy to us aging gamers that no longer have the fine motor skills of an arcade rocket surgeon (that's not a real job). Do yourself a favor and pick up this truly polished piece of retro gaming goodness to enjoy yourself, or to give your kids as their first true gaming challenge. I'm not a big gamer, but there's something about this game that makes me want to play and play. I love the retro-style vector graphics and sounds. The design is reminiscent of classic arcade games, while bringing a healthy dose of originality to the genre. The game play is a perfect balance between difficulty and rewards. For a casual gamer like me, this game will stay on my iPhone for a long time. Buy it! You'll be glad you did.